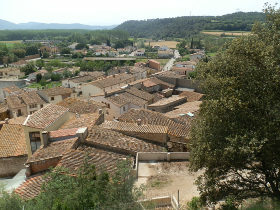 Cervia de Ter is a village on the northern side of the river Ter not too far from Girona. 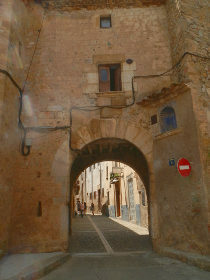 We headed to Cervia de Ter almost just to tick a box as it was one of the few villages we haven't visited, and then, like many places on the Costa Brava it surprised us. As with many villages, the main road skirts the fringes and its only by stopping and walking do you find the real character of the place. Our surprise was to discover this was a town with a monestary and a castle (in ruins), part of the Ruta del Santiago from Sant Pere de Rodes and so formerly more important than the current sleepy unknown village it is today. A monestary and a castle means an older town centre with nooks and crannies to be discovered almost like a rough unspoilt French village transplanted into Catalonia. We park near to the school on the east of the town and then walk through towards the centre. The first building we come across is the old monestary and church, now converted into council offices (adjuntament). Inside are cloisters, though we didn't visit this time around. From here we take a bit of a haphazard route through the streets to explore passing through one of the old town gates along cobbled stone streets. On a Sunday, as with many Catalan towns, the place is quiet and sleepy dormant in the spring sun. 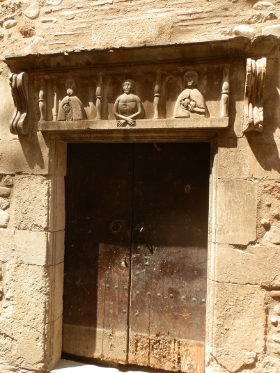 A carved lintel above an old doorway has a series of three figures marking one of the important town houses. 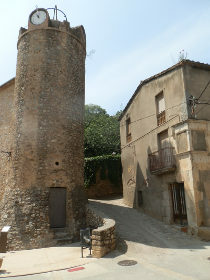 We find a route marked towards the castle and come to a tower with a clock that marks the route up to the castle and the line of the town wall above the street. Trying to get to the castle we find narrow streets that end with old in-town farm houses with geese and chickens in the yards and hapazard buildings. These are the types of ancient rural living that would be perfectly in place in the Dorgdogne or the centre of France. 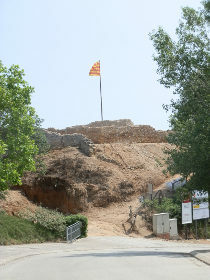 The road up to the castle is blocked due to renovations, so we walk back into the village and then follow the road up the hill to the castle from the back. The castle stands above the village with views across the roof tops and out tot he valley of the river Ter. To make it more of a walk than a visit we carry on up the hill past the castle and out into the woods and fields at the back. As we go up the views become better with vistas across to the hills around Girona in the distance. The road is easy to follow as it just loops around and fields of wheat and barley are turning from green to gold in the sunlight, dotted with red poppies. The road turns past a couple of farms and we turn into the woods not quite knowing where we're going, but trusting that the track is taking us back to Cervia as the map we have has Cervia just on the merest corner. Fortunately the tracks are broad and easy to follow through the woods and we emerge by a farm at the bottom of the hill with the Ruta de Santiago signs (a scallop shell) marking the way back to Cervia.